VERSATILE AND DEPENDABLE: 1 x 3.5 inch & 1 x 7 inch extensions included, it can accommodate openings of 38 - 53 inch wide, 29.5 inch tall. Additonal extensions sold separately, the gate can be extended up to 198.5 inch. Chelsea Xtra-Wide Hallway Auto-Close Security Gate - White The Dreambaby Chelsea Xtra Wide Hallway Auto-Close Metal Baby Gate combines safety and convenience in one fantastic package. Great for every home, this pressure-mounted gate features one of the widest and most sturdy single-piece construction gates that is easy to install with no screws or drilling required. The Dreambaby Chelsea gate is easy to install, allows for one-handed operation, a door that opens in both directions and closes automatically from any distance, every time. For added security, the EZY-Check indicator shows the gate is securely locked with just a quick glance and the double action locking feature helps keep even the most curious toddlers at bay. Smart Stay-Open feature is perfect for when you need to move freely through the gate. Just swing the door in the stay-open position and it will stay wide open until you choose to close it. 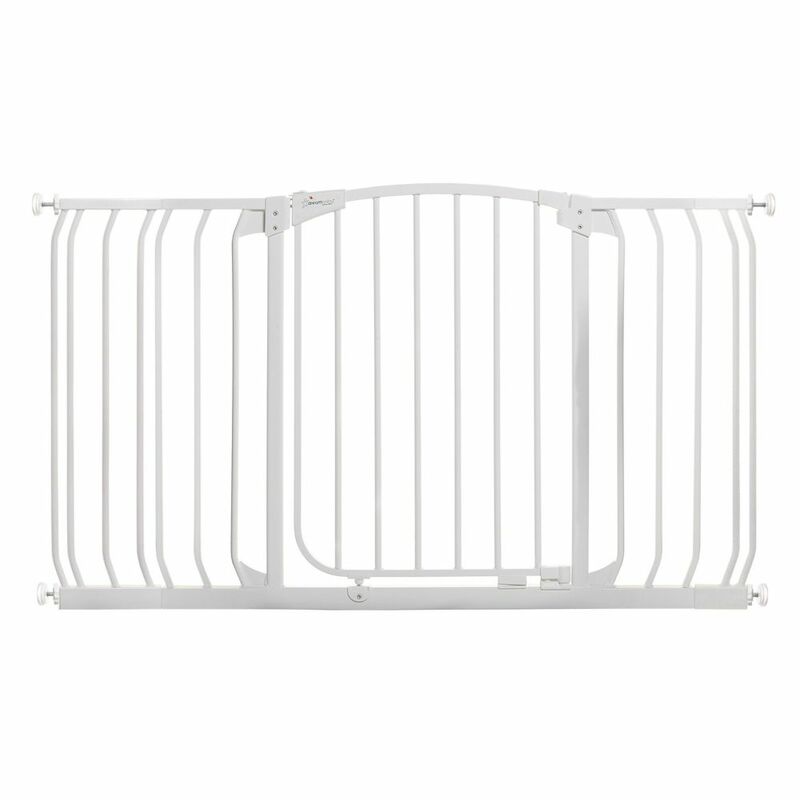 Chelsea Xtra-Wide Hallway Auto-Close Security Gate - White is rated 4.4 out of 5 by 65. Rated 4 out of 5 by Jay from The gate action is very good. The extensions integrate easily.... The gate action is very good. The extensions integrate easily. The only issue I had was the opening I needed to fill was 81". At that length the product doesn't stay together well and can be pushed to disengage from the walls. I zip tied a 1/2" OD pipe to bottom of frame and that solved the problem. Rated 5 out of 5 by Hollie from Still a great product and improved! I purchased a Dream baby gate years ago and it has always worked well. When I needed another I went right to their website. The gate a bought this time now stays open when needed creating an easier walkway. Very convenient and always good quality. Rated 5 out of 5 by Mike from I purchased, liked it so much I purchased another. Like the extra height compared to others. Easy to open and close for adults, but has great safety lock for the little one.